Yosa Buson was a popular japanese poet and painter of the Edo period. Along with Matsuo Basho and Kobayashi Issa, Buson is considered among the greatest poets of the Edo Period. 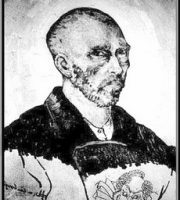 Buson learned poetry under the tutelage of the haikai master Hayano Hajin. Following in the footsteps of his idol, Matsuo Basho, Buson traveled through the wilds of northern Honsh? that had been the inspiration for Basho's famous travel diary, Oku no Hosomichi (The Narrow Road to the Interior). He published his notes from the trip in 1744, marking the first time he published under the name Buson. After traveling through various parts of Japan, including Tango (the northern part of modern Kyoto Prefecture) and Sanuki (Kagawa Prefecture in Shikoku), Buson settled down in the city of Kyoto at the age of 42. It is around this time that he began to write under the name of Yosa, which he took from his mother's birthplace (Yosa in the province of Tango).